At the rear of the engine, fastened to the end of the crankshaft (or output shaft, on K models) is the clutch carrier, or clutch housing. This used to be called the flywheel, but BMWs haven't really had flywheels since 1980. The clutch housing holds the steel pressure plates, which sandwich the outer edge of the clutch disc (or friction disc) between them. The hub of the clutch disc has splines that drive the input shaft of the transmission. The splines allow the disc to center itself between the clutch plates. From left to right, the parts shown are the clutch housing, clutch spring, pressure plate, clutch disc, and housing cover. The cover is bolted to the housing, effectively locking all parts together until you squeeze the clutch lever. When you do, the spring relaxes and the disc is free to spin between the pressure plate and cover. Since the disc is permanently coupled to the transmission and the other parts are bolted to the crankshaft, this assembly connects and disconnects the driving force between the two. The clutch disc is what we're mainly interested in. Shown here is a clutch disc and the input shaft. The hub of the disc is a casting that is cut with internal splines, and the webbing that carries the friction material is riveted to it. Remember that the disc is held captive in the clutch housing, which is bolted to the engine. When the transmission is installed, the input shaft of the transmission slides into the splines in the hub. Lubrication here permits the clutch disc to center itself between the pressure plate and cover, and also prevents corrosion of the spline teeth. This was an informal service requirement on boxers and a 20,000-mile item for K-bikes up until about 1989 when nickel-plated splines were introduced. At that point the lubrication interval was extended to 40,000 miles, and when the Oilheads were introduced the lubrication requirement was eliminated completely. The vast majority of Oilheads go 100,000 miles and more without any maintenance in this area. The splines are lubricated when the clutch disc is replaced, or when the transmission is removed for any other reason (like an oil leak). When finally examined, the splines are usually dry but not worn. K bikes also may have dry splines but this not usually accompanied by wear. The failures can happen at mileages as low as 20,000 and 30,000 miles, well before the splines would have been serviced by the old schedule. In the case of a recurring problem, the grease may still be intact. Clearly, some other factor is at work when a spline fails at 30,000 with grease still intact, if the others are going well over 100,000 with no sign of wear. Let's take a closer look at the interface of the clutch disc to the transmission input shaft. Disregarding the friction material and webbing, we're left with the splined hub and the forward end of the transmission input shaft. This illustration gives the true-to-scale relationship of these parts. The thin lines at top and bottom are the webbing connecting the friction material to the hub. 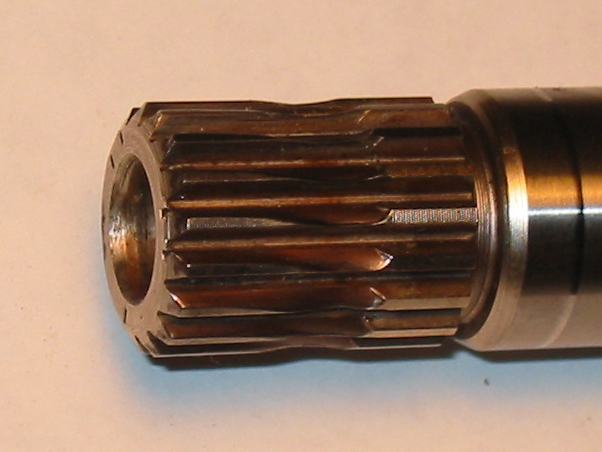 The black sections represent the overlap of the splines on the hub and the shaft; this is the contact area that connects the two. Now imagine the forces acting on the clutch disc. Axial: As the clutch is disengaged, the pressure plate moves forward and the clutch disc will move forward slightly, away from the rear plate. When the clutch is engaged, the pressure plate moves the clutch plate backwards against the rear plate. The splines on the shaft allow for any movement in this direction. Rotational: Obviously we have the torque of the engine pushing the friction material one way, and the inertia of the bike resisting it through the transmission. The flanks of the splines resist this load. That's all we're supposed to have, but what happens when something isn't right? Materials have changed over the years due to concerns about longevity - this was behind the move to nickel-plated splines in 1989 - but the occasional part might miss a heat-treating step or might have a material flaw. I've heard that this was part of an early change to the six-speed clutch discs. But another cause of damage can be misalignment or physical damage to some of the clutch components. There are four main ways that misalignment of the components could impact spline wear. Keeping in mind that there is some clearance between the parts, let's ignore the splined contact area and just look at the overall fit of the hub to the shaft. 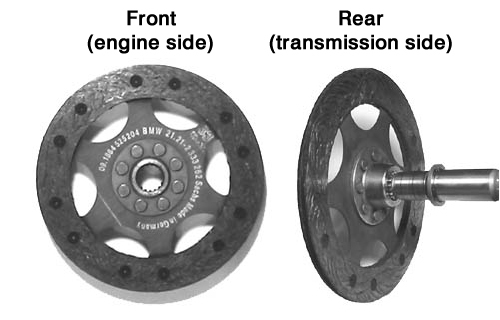 These diagrams portray the clutch housing on the left, the input shaft on the right, and the entire clutch disc in black. Obviously the amount of clearance between the parts is exaggerated. 1. A lateral misalignment would probably result from mismachining of the engine case or the transmission housing. Here, the input shaft is too high (or the crankshaft is too low). One side of the hub would be pressing against the shaft and the other side wouldn't. The load would be distributed across the entire side of the hub, and as the parts rotated all of the surfaces would bear the load at some point. A certain degree of this misalignment (a few thousandths of an inch) is normal, due to manufacturing tolerances. 2. An angular misalignment of the two parts would involve actual bending of the engine block and transmission housing, or misalignment of the various machining processes performed on each. It would cause one side of the hub to press on one end of the shaft and the other side to press on the other end. It would cause accelerated wear at these two areas that would spread until the splines stripped completely. As the parts rotate, the entire circumference of the two area will be affected. With concentric machining tools, there should normally be none of this misalignment present. 3. A distorted disc is usually the result of careless installation, if the weight of the transmission rests on the hub of the clutch disc as the transmission is installed. It will create a point loading as in the second case, but the affected area would be concentrated at specific points on the disc and hub and the wear might not be evenly distributed. 4. A bent housing will act like the bent disc but the load will change to a different location every time the clutch is engaged, making the overall effect more like the second example. When the clutch housing replaced the flywheel in 1981, there were problems like this. In the second part we're going to look at a few specific instances of spline failures, including R1150 models, and see how they fit with the examples shown above. In the meantime, take a look at this R1150GS input shaft and tell me what you think happened to it (hint: the clutch disc didn't look very good either).